Easy-to-see signs warn approaching pedestrians of potential hazards. Bright yellow sign has a black message on both the front and back making it easy to read from each direction. 12"W x 20"H overall. Durable plastic material. 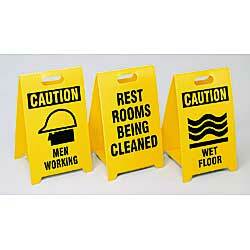 SPECIFY MESSAGE: A - Caution Wet Floor, B - Caution Men Working, C - Restrooms Being Cleaned. IN STOCK.